Gardeners are a proud lot. We love to show off our gardens. We also love to share them, and there seems no end to the gifts we can create with our bounty. Herbs, flowers, leaves and even seeds can be turned into thoughtful gifts to give year round, and they don't take much effort at all since you were gardening anyway, right? Here are 12 quick and easy gifts from the garden that your friends will love to receive. Herbs and fruit are best enjoyed in the season unless you turn them into something wonderful like herbal jelly. Herbed jelly or jam on your toast can do wonders for the start of a winter's day, to say nothing of what it could do to your Christmas ham. And just as with making garden candles, you don't necessarily have to start from scratch to infuse your jellies with the senses of your herb garden. 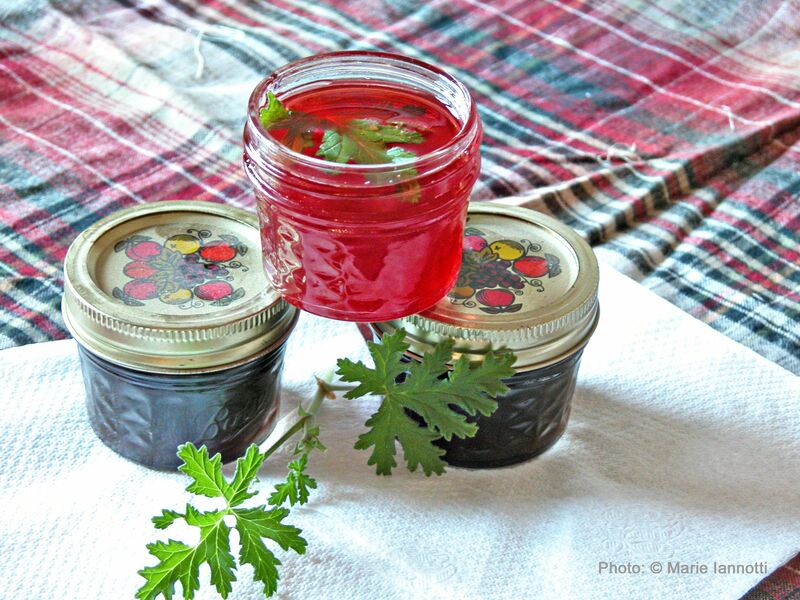 'Homemade' herb jellies are another great gift idea and a nice seasoning to have on hand in your kitchen. It's not tomato bragging season, but we still want to show off our gardens around the holidays. How to Make Herbal Sugars is the first in a series of 12 Days of Christmas from the Garden, featuring easy to make gift ideas using dried herbs, flowers, and foliage from the garden. None take a great deal of skill or time, but they all add the elements of nature and fragrance to your holidays. So share your garden with friends this holiday season or make yourself a gift or two. Candle making is fun but messy. Rather than starting from scratch, you can take a ready-made candle and give it a personal touch from your garden, by melding leaves, flowers, ferns, and herbs right into the wax. The result is beautiful, and these candles make you look as if you're very, very clever. And you are! Here's a nice way to build on About's Guide to Beauty's ingenious 'Keepsake Potpourri,' dried flowers and petals saved from bouquets and arrangements given to you on special occasions and tossed together over the years. Begin the potpourri mix with dried flowers, petals, herbs and fruits from your garden. Package the potpourri in a pretty jar or bowl. Then add a fresh bouquet or arrangement to be added to the mix. Or tie some flowers onto the ribbon around the potpourri jar. This is a favorite with romantic young girls and sentimental mothers alike. Maybe the perfect way to preserve fresh herbs is to make herbal oils. They don't last that long, maybe 2 months max, but when the herbs blend with the oil, it's the perfect way to spice up any recipe. You can mix up a batch in no time and decorate your kitchen with a line-up of decorative bottles. They also make very expensive looking gifts, all the more priceless because you made them. Here's how to turn your herbs into herbal oils. If you'll be inviting friends to a party or dinner, whether it's during the growing season or the holiday season, here's a personal touch that will dress up your table and then dress up your guests' homes and gardens. Take cuttings of your favorite plants to use as favors or place card holders. Your friends have always envied your garden, so they'll love the fact that you're willing to share a piece of it during the season of giving. Flavored vinegars are as easy to create as pouring hot vinegar over a seasoning. You can use herbs, edible flowers, chili peppers or whatever you have that's tasty in your garden. And don't think these pungent beauties are just for salad dressing. You can dazzle this holiday season by whipping up all sorts of spreads, sauces and intriguing appetizers with your homemade flavored vinegars. Who wouldn't welcome a bottle of 'homemade' flavored vodka as a hostess gift? Your garden will become the talk of the party. About's Guide to Cocktails (now there's a job) has some tips on 'brewing' your own Lavender-Rosemary Infused vodka. Use her wonderful recipe as is or as a stepping off point for your garden concoctions. Basil is refreshing, thyme adds a savory quality, and there're always chili peppers for a little extra oomph. Experimenting should be fun. Scents fill the air during the holidays. You can help some of them linger by creating dried flower and herbal sachets. You don't have to be crafty. You don't even have to know how to sew. Just choose some of your favorite fragrant plants and turn them into fragrant keepsakes. Scented sachets from the garden can evoke an instant change of season. More often than not, herb gardeners are avid cooks. If you love to cook for your friends, then consider letting them in on a few of your secrets by presenting them with your special herb blends, as gifts. Here are 3 of the more commonly purchased herb blends. You probably grow all these herbs in your garden. Mix up a batch and share it, along with a favorite recipe or two. About's Family Crafts Guide makes a wonderfully aromatic pine cone potpourri that gently heats up, with the addition of Christmas lights, to infuse the whole room with the scent of pine. For a twist on this idea, try using aromatic dried herbs, like sage, rosemary, lavender, rose petals or any of the lemon herbs. To be on the safe side, I like to place my dried herbs in a glass bowl and then nest the bowl in white lights. The lights don't get hot, just warm enough to heat the oils in the herbs. For more punch to the scent, add a few drops of essential oils to the mix. If the scent of evergreens sounds good to you, you can always make evergreen sachets, to prolong the season. Are you a seed saver? It seems none of us can resist stashing away a few pods full of ripe seeds from the plants we're particularly fond of. We never trust them to return on their own, no matter how many years it's been since they disappointed us. If you're a seed saver, you have a wonderful gift opportunity. Share your stash with gardening buddies. Make up your seed packets and use them as holiday cards, gifts, place cards or stocking stuffers.